Capt. John "Bomboy" Llanes and crewman Scott Kadooka teamed up on this monster blue marlin with angler Miguel Koenig. 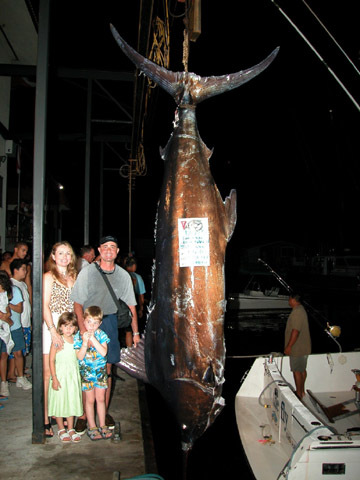 This fish won the 2003 Firecracker Open and is reputed to be the largest blue marlin ever caught in a tournament. It was no easy task, however, as the fish fought for nine hours and had to be landed in the dark. Capt. Bomboy Llanes operates the ON THE FLY as a charter boat out of Honokohau Harbor in Kona, Hawaii.